Is the risk of death the same when implementing "planned events"? What do the numbers we have as well as some specific events have say about that? Travis Dotson will provide prescribed fire practitioners a few specific elements to consider related to this topic and lessons available from both planned and unplanned fire events. About the Presenter: Dr. Tony Ward is a Professor and Chair of the School of Public and Community Health Sciences at the University of Montana. He has both a B.S. and M.S. in Environmental Science, and received his Ph.D. in Chemistry. His research focuses on investigating indoor and ambient inhalational exposures (including emissions from wood stoves and smoke from wildland fires). *Please note that beginning in 2019, NAFSE is using a new registration system (Neon) and webinar platform (Zoom). See video of webinar below. See the publications associated with this webinar here and here. Lyme disease, Rocky Mountain spotted fever, human monocytic ehrlichiosis (HME), and Southern tick-associated rash illness (STARI). These are just a few of the tick-borne diseases that occur in the eastern United States; some you’ve probably heard of and others likely not. Tick-borne disease incidence and emergence of new tick-borne diseases has increased dramatically in the past several decades. Thus, the need to identify effective ways of reducing tick populations and tick-borne disease risk is paramount. One method that has been proposed for reducing tick populations is prescribed fire. Join Liz Gleim, Assistant Professor of Biology & Environmental Studies from Hollins University to learn more about her research exploring the impacts of long-term prescribed fire on ticks & tick-borne disease risk and what appears to be some promising results linking fire to reduced disease risk. Shifting patterns of wildland fire activity threaten both human and ecological systems across the globe as the impacts of climate change continue to unfold. Collecting the fire behavior and effects data is necessary to strengthen understandings of these patterns and adapt management, yet collecting these data using traditional field based methods is impossible beyond the scale of small studies. As an alternative, correlations between fire-altered reflectance patterns in vegetation, fire effects, and fire behavior were assessed and used to make useful inferences about how fire impacts pitch pine barrens. This work incorporates data from studies of fire behavior, fire effects, and seasonality to show how burn severity data can be used to better understand the qualitative variety of fire and how observed patterns can be used to hone management strategy. Michael Gallagher is a post-doctoral researcher with the US Forest Service’s Climate, Fire, and Carbon Cycle Sciences work unit at the Silas Little Experimental Forest. Michael’s research has focused on integrating field and remote sensing-based approaches to assess and link fire behavior and fire effects. Michael is also a crewman on an New Jersey Forest Fire Service engine and fills in on Northern Area crews during the western fire season. In cooperation with the Lake States Fire Science Consortium. Two-aged aspen. Photo by Tony D'Amato. Dr. Ruby will present his informative webinar on the physiological limits of wildland firefighters and how to address energy loss on the fireline. Prescribed fire is often implemented only during the dormant season (i.e. during a short portion of the entire seasonal burnwindow). The effects of growing season burns differ significantly from dormant season burns. Join us for a webinar presented by Jack McGowan-Stinski, Program Manager for the Lake States Fire Science Consortium, as he outlines lessons from growing season burns, using examples from oak-pine and jack pine barrens (the latter of which behave similarly to pitch pine in our region). Jack's talk will explore fire effects, fire behavior, smoke, phenology, natural community response, monitoring, and other elements of seasonality in prescribed burns. Brose et al. 2013. The influences of drought and humans on the fire regimes of northern Pennsylvania, USA. Canadian Journal of Forest Research. 43: 757-767. Brose et al. 2015. Fire history reflects human history in the Pine Creek Gorge of north-central Pennsylvania. Natural Areas Journal 35: 214-223. Marschall et al. 2016. Fire regimes of remnant pitch pine communities in the Ridge and Valley Region of central Pennsylvania, USA. Forests. 7(10): 224. 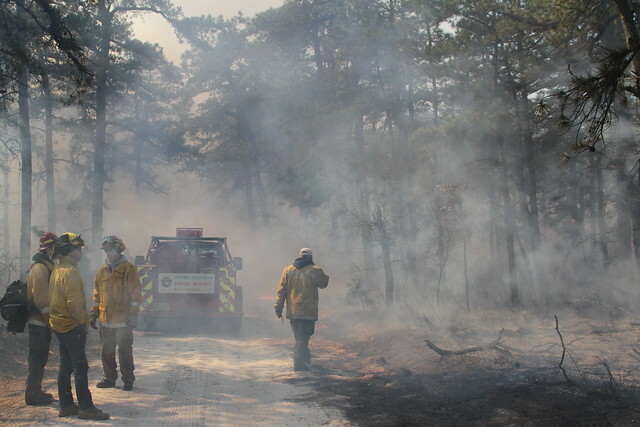 New Jersey's pinelands have a unique fire history. For this webinar, Dr. Inga La Puma highlighted a 90 year spatial fire history database of the pinelands including discussion of fire frequency, seasonality, and high fire years. Additionally, she will show how changes in fire frequency have changed the trajectory of forest succession in the region. Dr. Joe O'Brien hails from the Southern Research Station of the USDA Forest Service and has extensive experience in monitoring and analyzing prescribed fire effects. In this webinar, he will focus on fuels as one of the three elements that sustain fire and highlight the complex relationships linking forest structure, fuels and fire. These relationships are frequently underappreciated and oversimplified in the wildland fire community. Fuels provide a common ground linking the fire operations community, foresters and ecologists, and can act as a bridge among these communities. A more sophisticated understanding and appreciation of fuel variability as driven by forest structure is useful for improving fire management across varied ecosystems. Don't miss this informative presentation! September 21st, 2016 12:00PM to 1:00PM - SEE WEBINAR RECORDING BELOW! Lodgepole pine stands have always been an aggressive-burning forest fuel complex, but with the infestation of the mountain pine beetle, the bar has been raised in terms of fire behavior and suppression/tactics. Forest fires are now burning with devastating results, leaving large areas of blackened ground and wildland fire managers and resource managers frustrated and confused. Existing wildland fire prediction models and fire suppression efforts are severely challenged in the burning of this “new” forest fuel complex. Dana’s talk will give the British Columbia experience with an unprecedented infestation and the resulting wildfires in this new fuel complex, including the development of a new forest fire fuel type model and fire behavior being observed in this fuel type. He will tie experiences in B.C. to our infestation challenges in the North Atlantic region. In this webinar, Dave King and Joan Milam discussed the impacts of fuels reduction and habitat restoration on bees, songbirds, whippoorwills, hognose snakes, butterflies, and moths at Massachusetts' Montague Plains. LANDFIRE is a multi-partner programed aimed at characterizing vegetation, fire and fuel characteristics for the United States. Many of the datasets build upon one another, making them easy to work with and adapt for local use. In this webinar, Randy Swaty of The Nature Conservancy’s LANDFIRE team will explore the pre-settlement vegetation and fire regimes of the Northeastern U.S. as modeled and mapped by LANDFIRE. This work is enabled by the Biophysical Settings models and descriptions, which Randy will describe. Also, there will be a “call to action” as LANDFIRE is aiming to update and improve these bundles over the next year. Here is a .pdf of the presentation and a video of webinar is below. Drs. Luke Dodd and Mike Lacki presented during the NAFSE webinar, "Fire and the Northern Long-Eared Bat: Vulnerability and Management Considerations." The webinar included basic bat biology as it relates to forests and forest management. Our presenters highlighted ongoing and emerging work at study sites in Kentucky. This presentation also addressed management considerations regarding the Northern Long-eared Bat, a species whose recent listing affects land managers' use of fire and silviculture on the landscape. In July we heard from Dr. Jenn Marlon on the response of forests and fire to climate changes and human activities in the North Atlantic. This webinar aired June 5th (12pm) and was led by Inga La Puma and Nick Skowronski of the NAFSE leadership team. We covered the resources available on our new website as well as other online fire science resources and tools specific to the North Atlantic region. Click below to view webinar recording.